As most readers of this blog know, I am a big foodie. I enjoy a great meal; be it a bbq sandwich or a seven course dinner. All that matters is the food is great for what it is. If you were to check my iPhone, you’d see a running list of all the restaurants in Nashville worth visiting. I’ve been to most of them, but still have some on my to-do list. My friend Rhonda forwards me press releases of new places opening up. Should you find yourself coming to Nashville, please email me for the list. My directory isn’t limited to Nashville. Yesterday a friend of mine in Tampa emailed me to find out where I like to vacation on the Gulf. Not only did I send him a detail of the places to stay on 30A (between Destin and Panama City), but I gave him a complete breakdown of all the restaurants to visit. Now as good as my Nashville restaurant list is, it is far from perfect. From time to time, one gets past me. A few weeks ago my buddy Rich’s girlfriend Maggie turned me on to a new place worth checking out. It is called Mangia Nashville. It’s what I would term a permanent pop up restaurant. The owner Nick uses a breakfast/lunch spot on Friday and Saturday nights, when the regular tenant is closed. I am assuming he pays a flat fee or percentage of his sales to the restaurant owner. He’s been hosting this “pop up” for over three years. All the tables are arranged to host groups. Even if you call with reservations for two, you’ll end up with a new family by the end of the night. Maggie made a reservation for nine of us a few Friday nights ago. Mangia only offers one seating per night. Our seven o’clock meal was over around ten thirty. So what makes this place special? You only pay fifty dollars per guest for a multi-course meal. Our meal included about three or four appetizers, one salad, two pastas, one main course of lemon rosemary chicken with a side of zucchini and two desserts. Each course is presented family style and passed down and around the table. Frankly, it was more than any of us could handle, but Nick and his staff have a solution for that. They include a generous helping of entertainment. Throughout the meal, traditional Italian songs play and the servers lead the guests in singing, clapping and arm waiving at the table. Half way through the meal, everyone gets up and dances. It was nice to see drunk people get more attention than my pitiful dance skills. The food is really good and with the entertainment, Nick has really latched onto something good. I’m betting he nets six figures for only being open two nights a week. Now that’s not such a bad gig. Though it’s only fifty bucks to get in, it’s not fifty bucks per guest to get out. Mangia offers wine and cocktails. They have quite a few signature martinis. 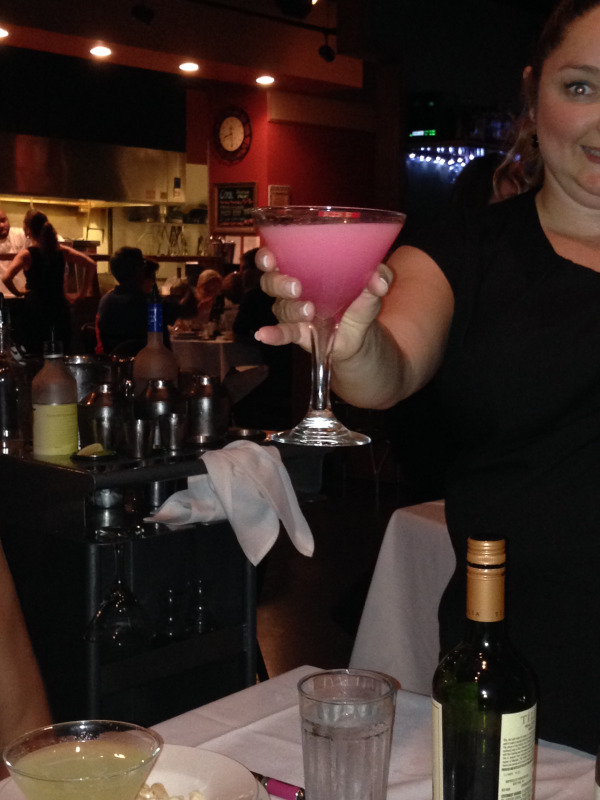 As I am a sucker for a girlie martini, I ordered one with pomegranate juice. It was adult Kool-Aid. Offering alcohol is nothing novel in the restaurant business, but not too many places have a portable bar cart. When someone is holding booze right under your nose, it’s hard to say no. And don’t forget the peer pressure of everyone at the table ordering a signature martini. Do you want to be the only party pooper? I think seven out of nine of us ordered a martini. I and another party pooper opted out. Now I would consider this experiential selling. The selling came as a result of the experience of seeing these drinks being made. 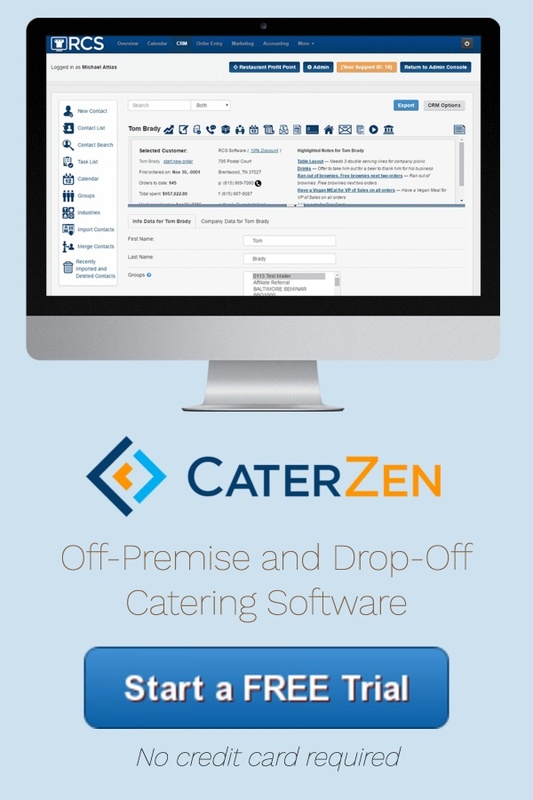 The same concept can be adapted, and often is, in the catering world. 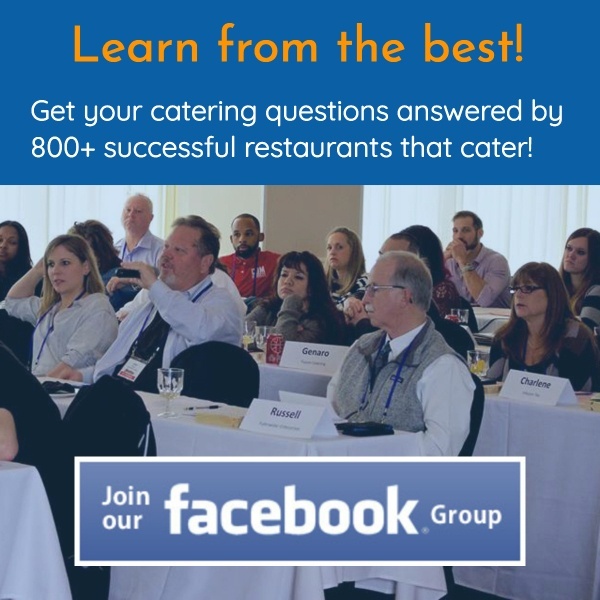 How many different catering stations have been or can be up sold for an event? Pasta, omelet, carving, grilling…and the list goes on. At Corky’s we sold onsite rib grilling as an up charge. People will pay extra for a bit of experience to go with their meal. Even our basic full service catering included a BBQ Chef to pull and chop the bbq fresh in front of guests. This did two things for us. We stood out from our competitors, because of the showmanship and freshness of the product. We kept food cost low, because we portioned out the most expensive part of the catered meal, the bbq. If you’re not pursuing full service events, now may be a good time to get started. Holiday catering season is just around the corner. If you are catering full service events, what can you add to your experiential catering line up?